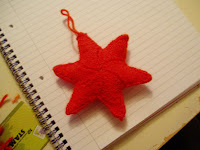 Keeping up my attempts to get presents made well in advance, so that I'm not panic knitting! This is the African Flower Purse, a free crochet pattern I found through Ravelry. It was a well written pattern, and very easy to follow, even for a novice crocheter like me. I lined it with a navy fleece and added a spotty pocket.